If you find these pages to be as beneficial for your students as I did, you can purchase the activity pages for Which Genre? 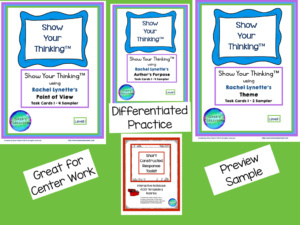 task cards 1-8 at Shea’s Classroom on TpT. 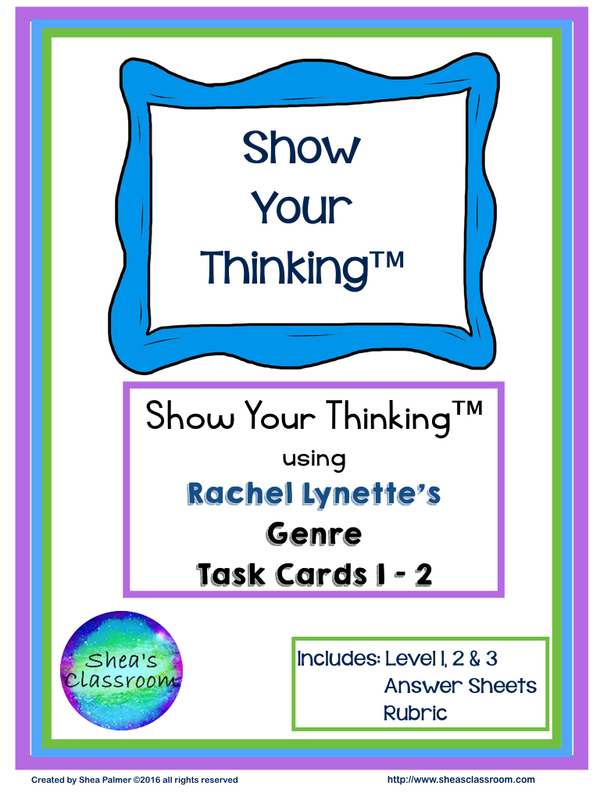 If you’d like to try activity pages for Rachel Lynette’s Author’s Purpose, Point of View, Theme and Genre task cards you can also purchase a sampler at Shea’s Classroom. Genre: This passage would most likely appear in the genre science fiction. Science fiction stories are often set in the future and/or outer space. Technology is also usually used in the story. This student now knows that he or she needs to find text evidence that describes a setting and use of technology that matches the attributes of science fiction. This narrows the scope of the text that they should cite. It provides a focus. Theme: The theme of this passage is persistence pays off. That means that, if you keep trying you will meet your goal. This student now knows that he or she needs to find text evidence that supports the idea that if you keep trying you will achieve your goal. This again provides a focus for the student as they begin citing the text. These are just a couple of examples of how asking our students to explain what they mean will help them identify the text that supports their answer. This one simple step really has helped my students. Of course, explaining what you mean isn’t always that easy to do. This is when it is the most beneficial. If you can’t explain what you mean, then it is impossible to analyze the text and explain how it supports your answer. 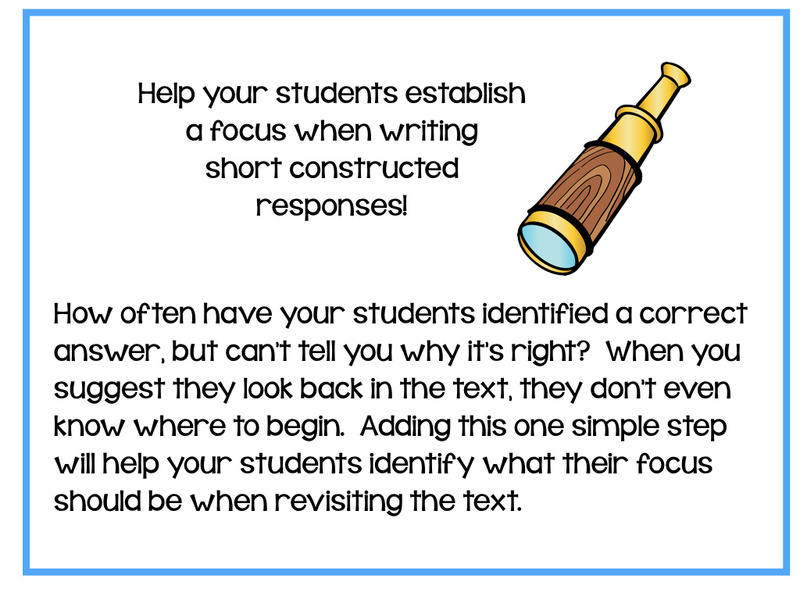 Improve Short Constructed Response Writing! Every year I participate in the regional scoring of the 5th grade NYS Common Core ELA test. While grading short constructed responses, I’ve been able to identify the skills that students need in order to be successful with both. First, they need to be able to state their answer. After that, they are expected to provide sufficient text evidence. Then they need to be able to analyze this text evidence to explain how it supports their answer. If the student is using the ACE acronym, they should be able to write a good short constructed response. At least that’s how it appears at first glance. The A stands for answer. The students are instructed that their first sentence should be a restatement of the question with their answer. Then they should move on to the next component. This is the C which stands for citing the text. The students are instructed to now write the text evidence that will support their answer. There are students who provide the correct answer and then struggle with the text evidence. If they are unsure, they often will do one of two things. One strategy I call “It’s Got To Be In There Somewhere.” Almost all of the text is included leaving you as the reader to figure out what’s important. The other I call “Didn’t You Read the Book?” This student writes a minimal amount of words, because they’re unsure what to include. It is at this point that many of the students are unable to complete their ACE. For those who are successful, the next step is to complete the E which stands for explaining how the text supports your answer. Many students are able to provide specific text evidence, but aren’t able to explain how this evidence supports their answer. Often what they will do is just restate or reword the text evidence. They know that the text supports their answer but they don’t know why. So how do we help these students? There has to be a way. So I began doing an informal action research project. After evaluating student responses and conference notes, I realized that while it appeared that these students were experiencing different challenges, they really weren’t. They weren’t able to identify specific text evidence or analyze the text, because they didn’t really understand what their answer meant. If you don’t understand what you’re trying to prove, it’s impossible to do so. Addressing this issue, I decided to add an additional step to the ACE which “forces” my students to really think about what their answer means. For the A, they are expected to write at least two sentences. The first is a traditional restatement. After that, in their own words, they write what their answer means. This benefits both the students and myself. First I know immediately if they understand their answer. Second, it clarifies for the student what he or she is trying to prove. I have been asking my students to do this for the past two years. This step has improved the quality of the responses that I’ve seen for all of my students. So now I tell my students that they need to restate, explain what their answer means in their own words, cite text evidence, and explain how this evidence supports what their answer means in their own words. It really helps them clarify which text to cite and how this text supports their thinking. 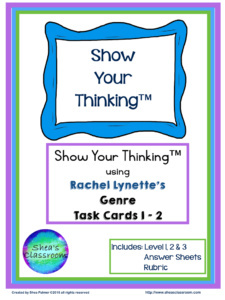 This sampler will give you the opportunity to preview the Show Your Thinking™ activities I’ve developed to help your students practice writing short constructed responses while using Rachel Lynette’s task cards. I will be releasing the complete sets this summer. My students have really enjoyed using these activities as their ability to analyze text has continued to improve. I’ve also included my ACED interactive notebook foldable and rubric which I used to introduce my expectations for a well written response. Visit my TpT store, Shea’s Classroom to purchase this product. 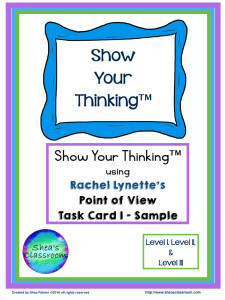 Just finished putting the final touches on this sample set of activity pages for Rachel Lynette’s Point of View task cards. 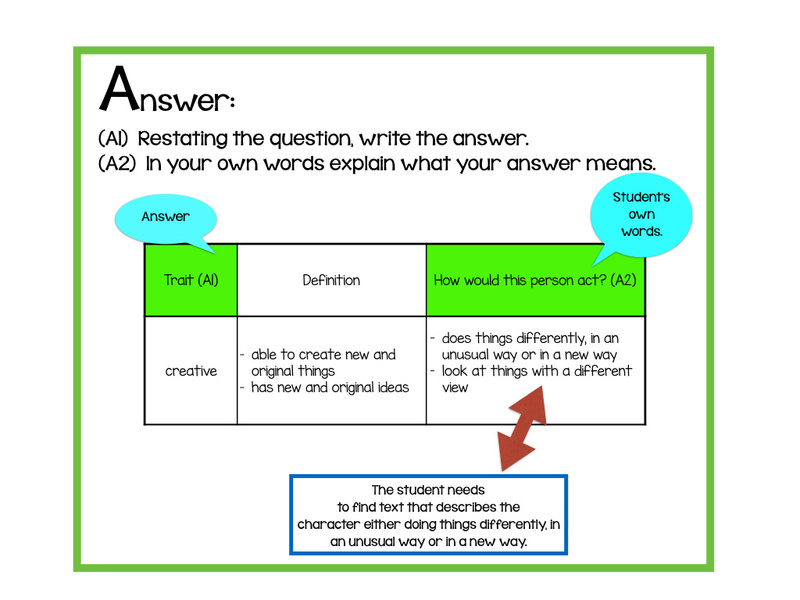 Download them here: Point of View Task Card 1 Sample Revision. Give them a try and let me know what you think! Use Show Your Thinking™ activity pages to help your students develop their ability to analyze text while explaining their thinking. 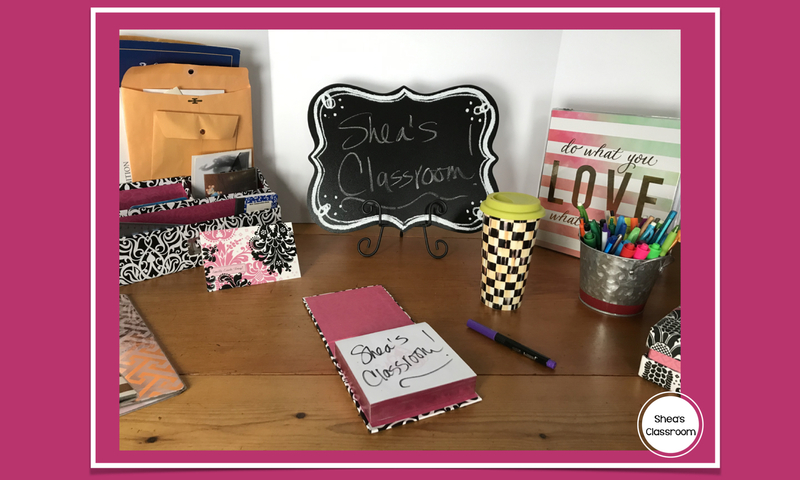 Visit my TpT store, Shea’s Classroom, to purchase this product. As I sit at my kitchen table drinking coffee this morning, I’m beginning to think about returning to school on Monday. I’ve been fortunate enough to have a very relaxing week off. I haven’t thought about school at all. As we begin the new year, I have to remember that my students will not be returning ready to hit the ground running. We’ll need to ease into things. Hope you have a good first week!